Stainless steel case with a stainless steel bracelet. Fixed stainless steel bezel. Silver dial with luminous black hands and index hour markers. Arabic numerals mark the 6, 9 and 12 o'clock positions. Minute markers around the outer rim. Dial Type: Analog. Luminescent hands and markers. Date display at the 3 o'clock position. Power reserve subdials. Citizen Caliber Eco-Drive J850 eco-drive movement with an 8 months power reserve. Scratch resistant mineral crystal. Pull / push crown. Solid case back. Round case shape. Case size: 41.5 mm. Case thickness: 11 mm. Band width: 21.5 mm. Fold over clasp with a push button release. Water resistant at 100 meters / 330 feet. Functions: date, hour, minute, second, power reserve indicator. Sport watch style. Watch label: Japan Movt. 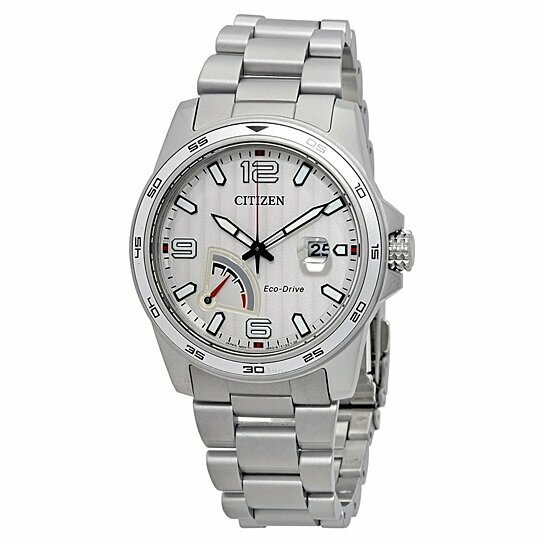 Citizen PRT Silver Dial Stainless Steel Mens Watch AW7031-54A.